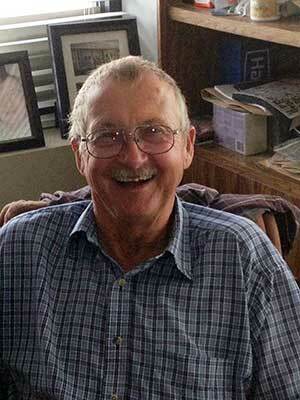 Dave Sexton, head of the Mezotrace family business. The Mezotrace® mine began in 1964 after founder Glen Sexton retired from the logging business in California and moved to Nevada because of asthma. He was an avid hunter, and one day he was hunting in a canyon for Chukars—birds in the partridge family—when he came across a rock formation that he found intriguing. He picked up some samples and sent them to a lab to be analyzed, where he discovered that the stone was 97 percent carbonate and very rich in calcium and magnesium. This mineral compound was completely different than other mineral formations. Intrigued by the high calcium and magnesium carbonate component of the material, Glen suggested to his father that he might feed the compound, which is now known as Mezotrace®, to their Pomeranian dogs and dairy cow. Father and son soon discovered that the animals thrived on Mezotrace®, and the cow produced more milk and butterfat. Seeing these results, Glen staked a claim in the Nevada canyon, and developed the Mezotrace® mine and launched the Mezotrace® product line. Great care has been taken in the mining, milling, and production processes. 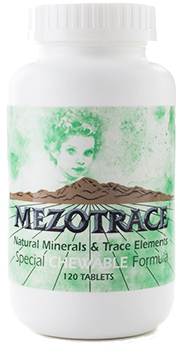 The Mezotrace® mine grinds about three tons of Mezotrace® an hour. 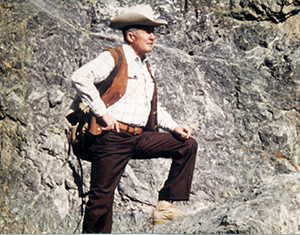 Glen Sexton, founder of the Mezotrace Mine. Glen’s children took over the mine twenty years ago, and it is now run by the surviving son Dave Sexton and his wife, June. June runs the Mezotrace® office while Dave is a jack-of-all-trades, working as a miner, truck driver, miller, etc., for the company. The man with the cowboy hat on the bottle’s label is Glen, a man known for his curiosity, guts and fortitude. While early sales of Mezotrace® were within the dairy industry, but after more tests, the Mezotrace® compound was found to have benefits for humans, too, so a larger product line was formed for people. A line for horses was added, as well. Animals love Mezotrace so it feeds easily. “Mezotrace® is a sleeping giant,” notes Dave. He is passionate about its health benefits and has been overwhelmed with testimonials from customers whose lives have been transformed for the better by taking this unique compound of minerals and trace elements.